As part of her doctoral dissertation at Stanford University, Carolyn Snyder , now a climate policy official at the U.S. Environmental Protection Agency, created a continuous 2 million year temperature record, much longer than a previous 22,000 year record. 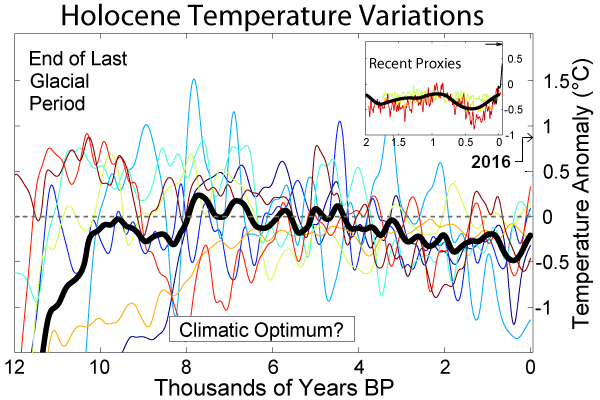 Snyder's temperature reconstruction, published Monday in the journal Nature , doesn't estimate temperature for a single year, but averages 5,000-year time periods going back a couple million years. Snyder said if climate factors are the same as in the past—and that's a big if—Earth is already committed to another 7 degrees or so (about 4 degrees Celsius) of warming over the next few thousand years. "This is based on what happened in the past," Snyder said. "In the past it wasn't humans messing with the atmosphere." Scientists give various reasons for past changes in carbon dioxide and heat levels, including regular slight shifts in Earth's orbital tilt. Four outside scientists praised the study's tracking of past temperatures, with caveats about how less certain it is as it gets deeper in the past. Jeremy Shakun of Boston College said "Snyder's work is a great contribution and future work should build on it." But many of the same scientists said Snyder's estimate of future warming seems too high. Shakun called it unrealistic and not matching historical time periods of similar carbon dioxide levels. A fifth scientist, Michael Mann of Pennsylvania State University, called the study provocative and interesting but said he remains skeptical until more research confirms it. He found the future temperature calculations "so much higher than prevailing estimates that one has to consider it somewhat of an outlier." Kiss our collective arses goodbye. Thank you, big oil. @R.M.J. Big oil, yes, but save some sarcastic thanks for religions that encourage overpopulation, bad agricultural practices, mass consumerism and those that promote it, and an assortment of others that don't care unless it impacts them directly right now. Why does everyone blame big oil? They are not the ones that are burning it, consumers are. As far as religions go there you can blame Catholics and Islam. They are the only two I know of that encourage procreation without common sense. I don't know of any that promote bad agricultural practices or mass consumerism so why don't you tell us which ones those are? Which puts this more in the 'oh that's interesting' category more than the revolutionary category. But I often find these experimental methodologies often feed into more robust estimates later on. So this is probably good preliminary work. But she also found that the temperature changes correlated well to carbon dioxide levels. This is where it gets interesting. We know that studying the cycle of increased GHG = increased temps = increased GHG provides insight into what we can expect if we keep pumping GHG into the system. This further re-enforces that cycle and provides another line of evidence that increasing GHG leads to predictable temperature increases across the system. he found the future temperature calculations "so much higher than prevailing estimates that one has to consider it somewhat of an outlier." If even Michael Mann is skeptical, you might as well chuck this one. Their measurements differ and fluctuate drastically, but most of them roughly show a similar 10,000-year trend. leetennant, if GHG = increased temps = increased GHG, why hasn't the earth become Venus long ago? Over millions of years there have been several previous cycles of both higher and lower levels of both GHG and temperature. Either there are damping mechanisms that moderate the effect you suggest that haven't been accounted for yet, or the relationship isn't as straightforward as you indicate. a "runaway greenhouse effect"--analogous to Venus--appears to have virtually no chance of being induced by anthropogenic activities. Venus has an atmosphere that is 96% CO₂ compared to Earth's paltry 0.04%. I think you just answered your own question. The question is, if we keep going could we cause a positive feedback so stark it could cause the kind of runaway greenhouse effect that you see in Venus? I personally don't think so. But we wouldn't need that stark an increase to create conditions that aren't viable for humans. Only a temperature increase of between 4 and 7 degrees is sufficient. We're on track for 7. There is no value to cold weather. Each year, cold kills hundreds of thousands of people, animals. Warm weather doesn't come close to doing that. Year-round growing seasons in the north will be needed to counter privation brought on by rampant population growth in the 3rd world. Doom, doom, doom. Just a variation of the crazy religious guy on the street ranting how the end is nigh. Today is just pays a lot better. Jesus you people are silly. So if it's the indeed the hottest it's been in 100,000 years (based on proxies with admittedly large margins of error) where is the feared apocalypse? There is no value to cold weather. Each year, cold kills hundreds of thousands of people, animals. Warm weather doesn't come close to doing that. uhmmm.... you can't read, can you? or did your google break? All this happened without any influence of humans and life on Earth not only survived this extremely warm period, but it flourished. The real threat to life is Ice age, not global warming. Let me translate that for you Chicken Little retards. That's AGW Cult for "LIE". But hey, you hungry Chicken Littles must be fed. Just as one would expect being the Earth is nearing a peak in interglaciation period. Students publish hot topics to graduate. Professors support them to run their shops. They use science as tool to do all the business. All established science is concocted from graduate theses. All established science was done outside school, and were not graduate theses. Einstein and Newton's work were not graduate theses. Faraday, Maxwell, Darwin, Gauss, Huygens, Bohr, Euler, Galileo, Kepler... All their work was not graduate theses! "As far as religions go there you can blame Catholics and Islam. They are the only two I know of that encourage procreation without common sense. I don't know of any that promote bad agricultural practices or mass consumerism so why don't you tell us which ones those are?" Well, I would, if I had ever said religions had anything to do with bad agricultural practices or mass consumerism. Commas are separators in sentences, after all. But what would I know about that with my lowly degree in English Lit? Why does everybody focus on the absolute temperatures in the historical record. It is the acceleration we should be worried about. We have a global warming exponential spike happening that looks something akin to the federal reserve's funny money balance sheet. Let's see how many species survive the massive ramp because we choose not to stop burning and trashing every ecosystem on earth. Billions of clueless monkeys playing chicken with their planet because who cares. Why does everybody focus on the absolute temperatures in the historical record. Oh, exactly. I don't know how many times we've typed *pace and rate of change* on this forum. Over and over and over again. and still some blockhead goes "Temperatures were higher 2 million years ago" like that is relevant to anything. Show some initiative and think, leetennant. If you and the alarmist cabal keep attacking and driving away every "blockhead" and "denier" that dares to express any thought that in your world seems to threaten your dogma, you must expect new, uninitiated "blockheads" to replace them. How will you score any conversions if you constantly kill off every opportunity to educate? If you have any convincing arguments why don't you use those to answer the questions instead of attacking all the "blockheads?" that means, by definition, the denier cult is arguing from a position of "faith" (meaning belief without evidence) as well as argument from ignorance and conspiracist ideation - need i link that study (again) on conspiracist ideation showing their typical rejection of science? How will you score any conversions if you constantly kill off every opportunity to educate? ... so how, exactly, are you educating anyone? "the only "education" that you've actually managed to provide is how not to argue science"
What have you proven about yourself? Why are you hiding? Stop accusing and abusing others like a sniper too scared to show himself. I have to take back that last comment and apologize to everybody here for it. Continuing an argument is not in the interest of this forum. Mea culpa. OK! Let's take them one at a time and don't try to duck out by changing the subject. How about the alarmist cabal linchpin that CO2 is causing climate change when all throughout the ice core analyses indications are that temperature increases lead CO2 increases. In the last three hundred years your own records show a warming trend that began well before CO2 began to rise significantly. arguing science is about arguing from facts... you know, that stuff found in validated studies? so what i want is specifics! OK! Let's take them one at a time and don't try to duck out by changing the subject. Stumpy, I asked a simple question and it took you two posts not to answer. If you want to educate "blockheads" like me you will have to answer in your own words not send us to echo-blogs and websites that take days to weeks of study. So, tell me if you can why CO2 is causing climate change when all throughout the ice core analyses indications are that temperature increases lead CO2 increases. In the last three hundred years your own records show a warming trend that began well before CO2 began to rise significantly. 3- only you would say that validated facts are "echo-blogs"
what do you have that refutes that? how, exactly, does that teach you how to research or learn anything about science? how does that teach you how to validate a claim? how does that provide evidence of anything at all? OK, here is a quote from the link you provided. "According to Barnola et al. (1991) and Petit et al. (1999) these measurements indicate that, at the beginning of the deglaciations, the CO2 increase either was in phase or lagged by less than ~1000 years with respect to the Antarctic temperature, whereas it clearly lagged behind the temperature at the onset of the glaciations." Sorry, the echo-blogs reference was meant to be pre-emptive and was based on discussions in other threads. Still working on the sciencemag link. It would show that you understand the subject. It would show that you are not simply throwing links in order that you may overwhelm ignorant "blockheads." Nothing wrong with providing the links to substantiate your statements though. you mean Gish-Gallop like zeph, hannes/reeve and others? "And even when they are exposed, they can carry on as if nothing has happened, often making their accusers the targets of accusations of being victimized by THEM." -George you will never EVER be left alone to do what you do. People here will continue to dog you and expose you because we all know what you are and what you are capable of. While youre at it, why dont you Mea culpa your lies about being an engineer, your store-bought MS, your mil awards, your PV and EV, your education and experience, etc ect etc. -One of the interests of this forum is for the community to identify those who habitually abuse it and warn others of their presence. Horreeeeyyyy! There is hope yet. Lets get this interglacial at least as warm as the last ones and lets keep it that way for more than a 1,000 years. I realize that current information is often difficult to obtain, thus I accepted your link to the sciencemag article even though it is six years old and somewhat out of date. In that light I have difficulty understanding the apparent contradiction in this statement, "water vapor provides the strongest climate feedback of any of the atmospheric GHGs, but that it is not the cause (forcing) of global climate change." Can you point me to a more recent study that explains why CO2 does and H2O does not cause climate change? Science doesn't "go out of date"
Can you point me to a more recent study that explains why CO2 does and H2O does not cause climate change? 1- which study? Lacis et al? Makes you wonder when our current 'drowned' coastlines were set when the last interglacial had higher ocean levels than now? I suspect that the cycle of the incurring solar body is responsible. 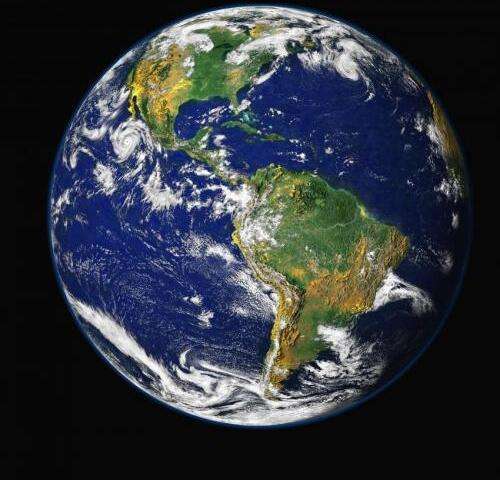 It comes in over a period of maybe a decade during which the higher core temps of the Earth heat the oceans and put more water vapor in the air, it departs leaving the water vapor to cool leading to an ice age, mini or otherwise. Science. 11- which study? Lacis et al? It is beyond amusing to see the Stumpid constantly pushing his goto reference, when it is so obvious that he lacks the capacity to read, far less comprehend, that piece of tripe. Hey Cap'n, have a look at how much manmade CO2 was emitted in the last 16 years compared to the previous and then compare the temperatures during those periods. I suggest that you get someone with a brain to assist you. I didn't place any label on it. But since it is six years old and I recall several articles on PO that seemed to expand on the topic that you might have better links to more recent findings. I did; and I did. Their statements are vague and ambiguous. I don't understand why condensing GHGs are dismissed while noncondensing GHGs are emphasized. If "your link to the sciencemag article" is not clear, how should I refer to it? I suspect that the cycle of the Comet Elenin is responsible. It comes in over a period of maybe a decade during which the higher core temps of the Earth heat the oceans and put more water vapor in the air. It departs leaving the water vapor to cool leading to an ice age, mini or otherwise. In fact, it's coming into our inner social system now so clearly responsible for current warming. Science. I did not recall any mention whether her data agrees or disagrees with the Milankovitch cycles. Lunar and solar cycles are not compared either. As I understand it, there was no permanent polar ice cap on the Northern hemisphere until about 2.5 mya. Humans have less to do with the global warming/cooling cycles than the AGW/Luddhite/Malthusian acolytes would have us believe. how should I refer to it? Their statements are vague and ambiguous. The headline and the study are total BS. How can you know it is total BS? Trees are coming to light under a melting glacier in Alaska about a thousand years old. It had to be warmer in the entire northern hemisphere for those trees to grow than today as no trees are currently growing where the ice is melting .The study is BS. If one considers that the glaciers covering large parts of the northern and southern hemisphere all melted off in a few hundred years per studies around 12000 years ago, it must have been warmer unless ice back than was using a different set of physics rules. Physics rules have not changed. The greenhouse gas effect is simple physics and it has not changed. Physics hasn't changed, but maybe your political perspective has and that is why your a climate change denier.